I was a bit apprehensive about this one – the flavors from the feta are pretty strong but Hubby really liked it, so that’s a win in my book. The picky boy is at boyscouts, so I’m going to go out on a limb and think he’s not going to be keen on it, but he’s a big boy and will get over it. This was a really quick meal to put together and I added some toasted Naan from the freezer – which is always tasty. Cook pasta according to package instructions, add in the rinsed & drained chickpeas for the last 2-3 minutes to warm them through. Place pasta in large bowl with the spinach & tomatoes.toss well then fold in the Feta Cheese and pour over the sauce. Mix well & serve immediately! 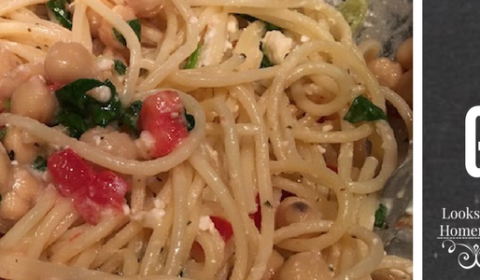 Really Tasty Vegetarian Greek Pasta Recipe!